With nearly 10,000 acres of high fenced South Texas brush to call its own, The Arrowhead Ranch has been a premier destination for hunters, photographers and birders for over 50 years. 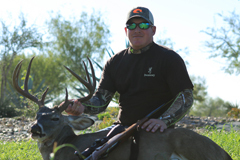 This family-owned and operated South Texas ranch has special hunting packages for trophy White-tailed deer, Scimitar Oryx, quail, turkey, dove, wild pigs and javelina. Highly trained guides will help you one-on-one to find the best game. The Arrowhead Ranch also offers packages for corporate outings and special events that can be held in a historic 7,000 square foot lodge and pavilion.